If someone made me king of Hollywood for a day, one of my first actions would be the installation of memorial plaques at every television studio where situation comedies are filmed as a tribute to Lucille Ball and Desi Arnaz. Although the duo didn't invent the format, they dared to experiment in a period when the newest kid on the block was still taking baby steps. As a result, they brought many production innovations that continue to be utilized today. Before the dawn of I Love Lucy in 1951, most if not all non-variety comedy programs were one-camera affairs supplemented with canned laughter. Ball and Arnaz didn't want artificial laughter; it had to be genuine, like the reactions of viewers at home. Filming in front of a live audience was just one of the stipulations the couple insisted upon when negotiations began with CBS to bring the series to television. In true Hollywood fashion, executives tried to meddle in every aspect from casting to where the show would be produced. Lucy wanted to parlay her real life marriage to Desi by having him play her husband on the show, but the network winced feeling viewers (much less prospective sponsors) would not accept a Cuban leading man. So, the couple hit the road on a national nightclub tour, playing to packed houses and rave reviews, discrediting that theory. After a pilot episode tested well, a bi-coastal tug of war between the network and the Arnaz's over where the show's production should be based commenced. CBS voted for the Big Apple, where much of its live programming originated, but Lucy and Desi wanted to take advantage of better production facilities on the west coast. Sensing a potential monster on their hands, the twosome also insisted that their pet project be captured on film rather than live transmissions that could only be preserved via poor quality kinescopes for future use. Balking at the notion, CBS would agree to this move only if the couple picked up the tab and work for reduced fees. Risky though it was, Lucy and Desi decided the gamble would pay dividends in the long run for their fledging Desilu prodction company; little did they know how huge of a goldmine they had stumbled upon. In less than a year, I Love Lucy became one of the country's top rated shows, moving to number one in its second season. Thanks to their savvy business sense and visionary foresight, the couple earned millions from selling the rights to their 179 episodes to CBS; in fact, the show's staying power was such that classic episodes played in prime time for an additional three years, with weekday airings becoming a staple of their mid-morning lineup through the mid-1960s. Once network airings ran their course, local stations were offered the chance to purchase the series, setting a precedent for the even more profitable process of syndication, which helped introduce the series to new generations that have embraced it in equal measure for the last five decades. 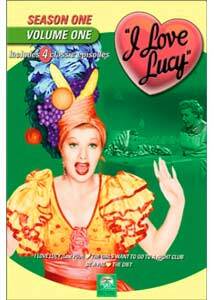 Beginning in the summer of 2002, the digital versatile disc faithful started getting in on the act with Paramount's excellent re-issues of the show's first season on the format, beginning with I Love Lucy: Season One, Volume One. Collecting the first three episodes from its freshman year with the legendary (and at one time feared lost) pilot episode, it offers evidence how one of the greatest ensembles in the history of comedy (including Vivian Vance and William Frawley as neighbors Fred and Ethel Mertz ) had chemistry from the onset. In one of those happy accidents that doesn't happen often enough, the self-financed pilot that Lucy and Desi produced to sell CBS on the idea resurfaced after 40 years, thanks to Joanne Perez, wife of famed Spanish clown Pepito Perez, whom Arnaz recruited for co-star duties in the historic filming. As a way of saying thanks, Desi presented Pepito with what turned out to be the only surviving copy. Discovered amongst the entertainer's treasured keepsakes following his death, Joanne got word to the Arnaz family, who put the wheels in motion to share this amazing piece of television history with the world. On the night of April 30, 1990, CBS premiered The Lost I Love Lucy Pilot in the program's original 9 Eastern/8 Central time period, capturing a massive audience, great reviews and an Emmy nomination. Just like old times. Though the plotline of Lucy trying to worm her way into showbiz notoriety via Ricky's nightclub act is familiar to long time fans who have seen dozens of variations on it throughout the program's six-year residency, every nuance, from Lucy's scream takes, to Desi's fractured English, felt like new again under these circumstances. There's something uniquely gratifying and sweet about watching these two soon-to-be legendary performers putting every ounce of emotion into a project they had so much faith in. Ironically, the two look much more comfortable in this presentation than some of their initial first season episodes, thanks to the utilization of material from their well-honed nightclub act (including Arnaz's passionate take on the classic Babalu). Other fascinating moments of note include the duo's outward appearances (Arnaz' untamed pompadour; Ball's shoulder-length mane reminiscent of her cinema days) that contrast sharply when compared to their more polished look in months to come, the absence of supporting players (save for Pepito, whose baby talk act is hilarious, and short-lived cast member Jerry Hauser as Ricky's agent) and the cost-cutting set designs (which makes you thank God the Arnaz's held their ground and didn't settle for second best in terms of quality, once the CBS deal was sealed). The granddaddy of all television comedy pilots merits a perfect five heart rating. On the eve of their 18th wedding anniversary, Fred would much rather spend a night at the fights then live up to his promise of taking Ethel to the Copacabana. Guess which sides Ricky and Lucy wind up on? Yep, it's a battle of the sexes, with the girls threatening to make off with eligible male escorts, which suits Freddy just fine, but Ricky is a mite worried about the competition. With his old datebook nothing but a memory, a lonely evening looms ahead until our fave Cuban bandleader calls his friend Jeanie for help. After she fixes the boys up with two of her contacts, all is set for Fred and Ricky to play spy. Meanwhile, the girls have had no luck in landing companions for their night out. At wit's end, who should the former Miss MacGillicuddy call but Jeanie, who unwittingly lets the cat out of the bag, setting the first of many a Luuuuuucy scheme into motion that would make viewers double over with laughter for the next 6 years. Although it was the second episode to be filmed, CBS opted to use it to launch the series due to technical problems that affected Lucy Thinks Ricky is Trying to Murder Her (contained on I Love Lucy: Season One, Volume Two). A television landmark is off and running with a strong 3.5 debut. Lucy fears her marriage to Ricky has grown stale when he seems more focused on the morning paper than having a little chit-chat over coffee. Ethel suggests her pal take a look at her latest read, How to Keep the Honeymoon From Ending for help. After vamping it up in sensual attire doesn't do the trick, it's back to the book and the Be a Pal chapter. Inserting herself into Ricky's weekly poker game and cleaning house only helps to drive more of a wedge between them. Hoping that the third time will be the charm, Lucy goes full throttle in redecorating the apartment in an attempt to evoke memories of his childhood. But that's not the only surprise awaiting Mr. Ricardo, who comes face to face with living, breathing new additions to the apartment and Latin-flavored entertainment provided by you-know-who. Tight, fast-paced and wittily scripted, highlighted by Lucy's tribute to an famous banana-decorated song stylist. No self-help guide necessary to warm to the charms of this four heart showstopper. Despondent over gaining weight, Lucy goes into a blue funk that not even Ethel can counter ("What if I cried every time I gained a pound?". Not missing a beat, Fred sarcastically retorts, "Then we'd be up to our ears in tears!"). Meanwhile, Ricky's going through miseries of his own: after receiving word that one of the featured singer/dancers in his act is leaving to get married, meaning he's got to go through the aye-yi-yi process of audition routines again. Betcha can't guess who wants to get in on the act, eh? Winning Ricky over to a point, the vacancy is Lucy's to fill—provided she can fit into the departing hoofer's costume. With only four days until the act resumes, it's crunch time as Lucy crash diets and exercises her way toward the final weigh-in. Ball's wardrobe adjustment routine while auditioning is one of the first season's truly classic high points, with Desi's spirited rendition of Cuban Pete coming in a very close second. No need to sweat; you'll burn off calories laughing yourself silly over this four heart special. Image Transfer Review: At the time of I Love Lucy, no market for syndication existed and since a large majority of prime time programming aired live, repeats during summertime as we know now were not an option (since videotape hadn't been perfected at that stage). That makes the picture quality on this release even more stunning; Desilu took great care of their archives and it shows via the smooth, film-like sheen exhibited on the programs collected from their freshman year. Other than a stray speck of debris here and there, the quality of these black-and-white prints are nothing short of beautiful. Although some may feel cheated with only four installments per disc, the lack of overcrowding is the main reason why these shows look so good (sometimes, less is more). As for the pilot, we're lucky to have it at all, so even though it's littered with scratches and excessive grain, it's worth the price of admission alone. Audio Transfer Review: Tinny-sounding and lacking in lower frequencies at times, at least all the anomalies of beat-up television prints (crackles, popping, etc.) are distant memories in this transfer. Besides, this is not a project that lends itself to extensive tweaking and psuedo-surround experimentation (and for that reason, purists can rest easy). Extras Review: Thanks to low-key advertising and packaging, many Lucy aficionados most likely have no clue how many fascinating extras exist on the series' DVD releases thus far. Even the savviest of DVD fans could be excused for missing a few surprises, thanks to a so-so menu design (at least on this series of releases thus far). Original Opening: Those weaned on syndicated broadcasts of the last three decades or so will be drop-jawed when witnessing the show's 180 degree turn of an intro, taken from original airings featuring America's sweethearts descending to ground level from a pack of Phillip Morris Cigarettes (the program's sponsor back in olden days). Behind the Scenes: An 18-minute audio excerpt from producer Jess Oppenheimer's critically hailed Laughs, Luck...and Lucy gives great insight into the show's journey from conception to finished product ,with strong emphasis on Ball's battles to have Desi cast in the role of her husband. One dares to think what direction the situation comedy format would have taken had network execs played hardball and cast someone along the lines of Lucy's radio co-star, Richard Denning (George on My Favorite Husband); audio clips from that era of Ball's career prove her point (and it's not that Denning was bad, but he was too much like your typical, bland hubby that became a clich� in many a sitcom; Arnaz not only had natural chemistry with his wife, but a unique flair and charm that still stands out today). Radio Show: A special treat for Lucy's long-time faithful is the inclusion of Iris and Liz's Easter, a classic episode of her well-received radio show, My Favorite Husband, in its entirety (complete with vintage Jello commercials), featuring Bea Benaderet and Gale Gordon (Ball's future sidekick from The Lucy Show and Here's Lucy) in supporting roles much like the ones that Vivian Vance and William Frawley would play on the tube; the teleplay would serve as a blueprint for The Diet episode reviewed earlier. Other bonuses include a nicely done Guest Cast option, which enables you to learn a little about the supporting players on each episode, a wide variety of Special Footage ranging from altered material that only appeared on select re-broadcasts/syndicated versions, and Flubs, consisting mainly of barely noticeable dialogue errors. The once and forever king and queen of situation comedy get first class treatment on their initial DVD foray, given added value via the inclusion of the show's fabled pilot. If future volumes containing the show's most heralded episodes are this well done, I can't wait.